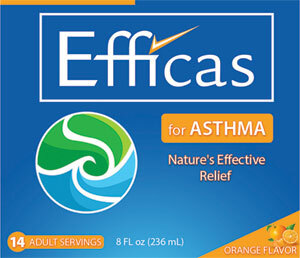 Efficas for Asthma’s formula is a patented blend of Omega Oils and other natural ingredients creating effective, non-prescription relief from Asthma symptoms for both adults and children. Efficas’s 3:2 ratio of GLA and EPA in just the right amount to safely, naturally inhibit leukotriene production. They are the substances produced by the body that are known to cause asthma symptoms. In a clinical trial, when Efficas was added to a daily diet, the production of leukotrienes was suppressed in 75% of asthmatics. If you’ve got asthma, there’s a good chance your body produces too many of them. Efficas is a non-prescription formula developed to safely and naturally inhibit the body’s production of leukotrienes which are involved in the inflammatory response and are known to cause many of the asthma symptoms. Wheezing, coughing, chest tightness, trouble breathing? If you suffer from asthma, you’re probably all too familiar with that list of symptoms. Well, now you may be able to manage those symptoms better than you ever have before. Efficas Care is a non-prescription nutriceutical developed to safely and naturally inhibit the body’s production of leukotrienes which is one of the main causes of Asthma simptoms. Efficas Care contains a unique combination of two essential fatty acids found in nature, GLA and EPA, in just the right amounts and ratio to effectively block the production of leukotrienes. Studies show that Efficas Care when taken every day results in a significant reduction of leukotrienes within 14 days. Quality of life benefits are evident within 14 to 28 days. Over 70% of Asthma sufferers reported a significant improvement in their quality of life. Over 65% of Asthma sufferers reported significantly fewer limitations on their physical activities. You or a Loved One Suffering from Asthma?